Last week I played around with some paper and clay to find a more spontaneous way to make temporary forms for paper mache display masks. I stole the wet paper armature idea from Jim Kransberger (thanks, Jim). He told me who he got the idea from, but I can’t remember who it was. 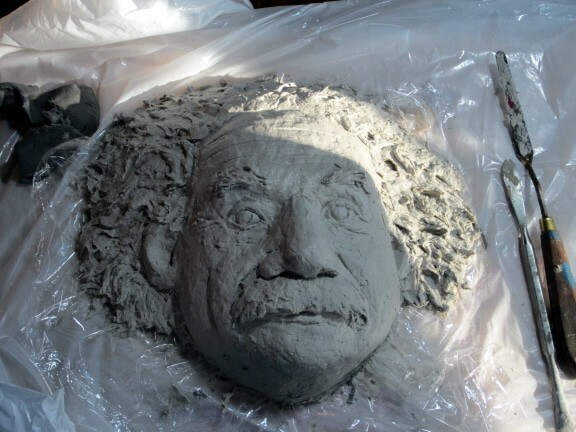 This process wouldn’t work for a mask that actually needs to fit a real person’s face, but it does work for a display mask like this Einstein-ish mask I’m working on now, and I can think of many other paper mache sculptures that could be made this way. You could use modeling clay instead of the pottery clay I used. And if you’re using paper mache clay for the mask like I did, you could skip the pottery clay step entirely and just go straight to step 5. (You would need the plastic wrap, though, or the PMC would never dry). 1. 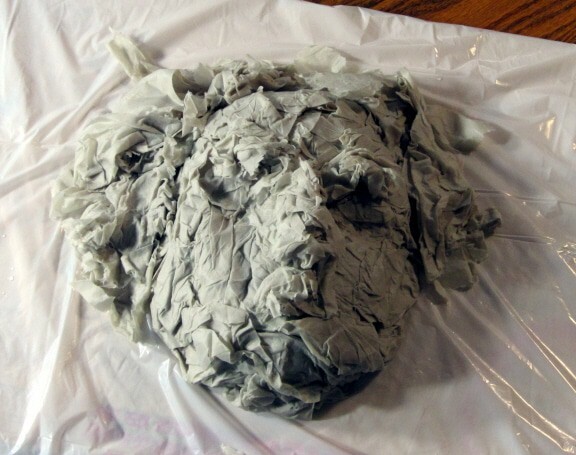 Get some newspaper wet, squish out the water, and start using it to form a very basic face shape. Be sure to have some plastic down on your table to protect it from the water. 2. Roll out a sheet of clay (optional, see above.) I used some pottery clay that I bought locally, but modeling clay would work too. 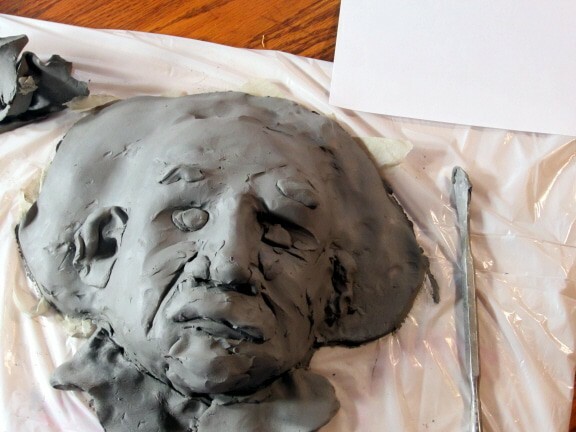 If you do use an oil-based clay, you’ll want to put some plastic over the wet paper first. 3. I was just trying to get slightly more realistic details, but this is really just an extension of the paper form. The actual details will be created later, because I used paper mache clay for the mask. I liked the fact that this process allows you to be spontaneous and playful. If you prefer to use paper strips and paste, you’ll want to get the details fixed in this step. 4. 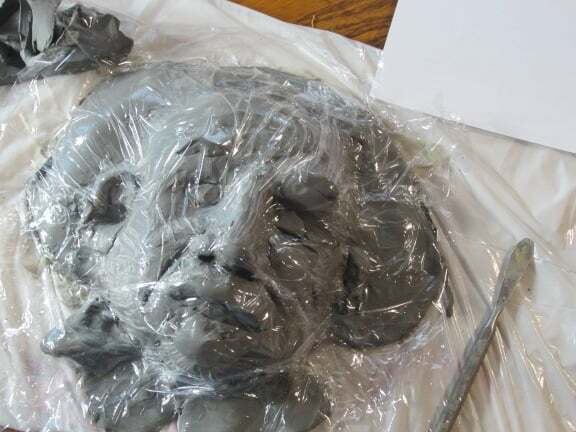 Lay some plastic wrap over the clay face. Because the paper underneath is wet, the clay won’t dry out and you can use it again for something else. If you’re using paper strips and paste and you don’t want the plastic to obscure the details you put into the clay form, you can use a release like petroleum jelly instead of the plastic. 5. 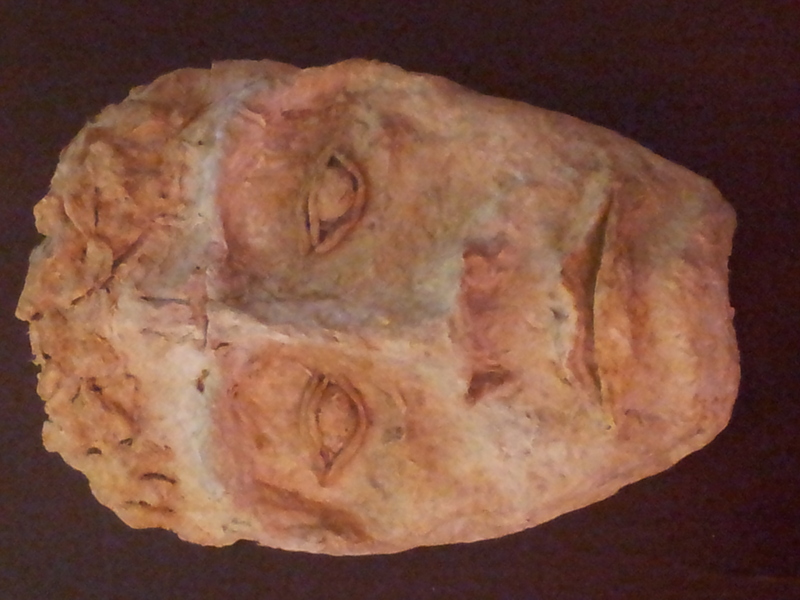 Create the actual display mask now, using paper mache clay, like I did, or with paper strips and paste. Let it dry in front of a fan, remove from the form, and paint. I added some very light wire that I bought in a small roll from the hardware store. You can’t see it in the little image below (I don’t know why I made it so small! 🙂 ) but you can see the wire in the final image. I love the way the wire gave Einstein his signature messy hair. 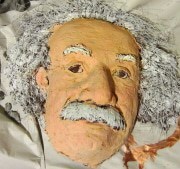 Paper Mache Einstein Display Mask, finished. It was fun to play with this idea, and I’m sure I’ll be using variations of this technique again. dry ? That looks like a lot of wet paper, kind of thick ? What did the back look like ? I guess I’m wondering, can you tell when all the wet paper under the clay finally dries ? Or does it even matter ? Is the back of the display mask unfinished, ? 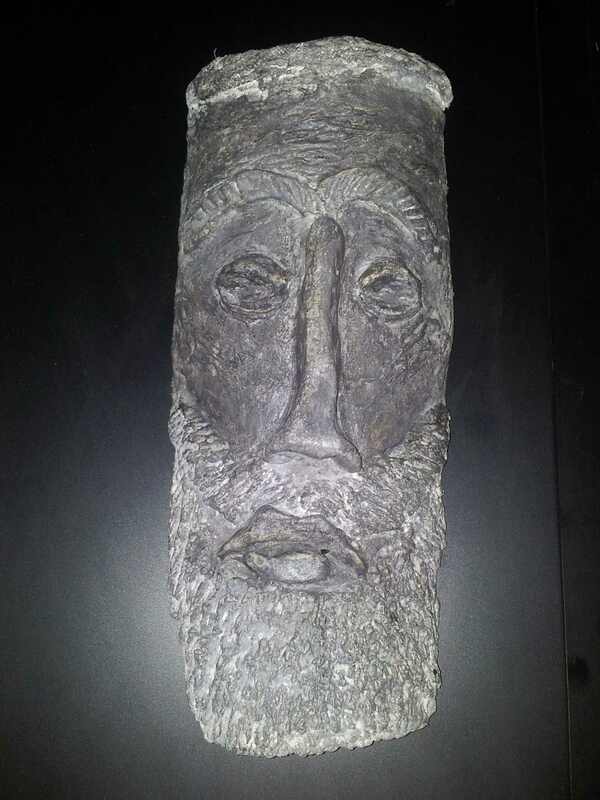 How would you hang a mask like that on a wall ? I haven’t been able to find anything online that shows how to hang masks, anything from a display mask like this to a carnival mask. I know I asked a ton of questions – sorry ! Hi Lori. The wet paper was just used to pad the space behind the clay, so I didn’t need to use so much clay. 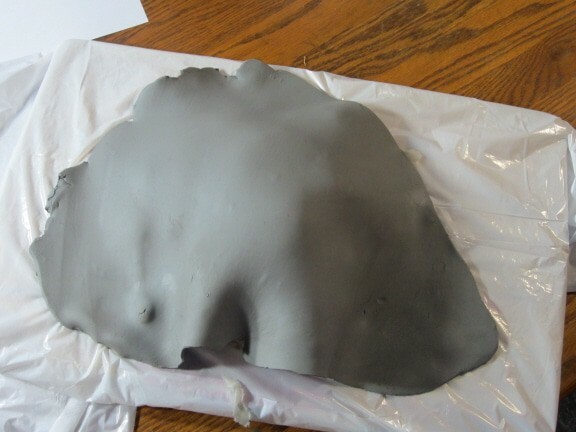 Both the wet paper and the wet clay were separated from the paper mache by a film of plastic, so it didn’t affect the drying time of the paper mache. And the mask was just that thin layer of paper mache, without all the paper and clay, so I was able to hot-glue one of those serrated picture hangers to the back and hang it that way. And yes, the back of this mask in unfinished. It’s just hanging on my wall, and I doubt anyone will ever see the back, except me. Hi Jonni, I’ve been experimenting with this same technique for sometime now – had no idea there was already a tutorial for it, might have samed some learning time. Here are some of my current results – I haven’t finished painting/polishing them though. I really like your face – it looks like it was made from terra cotta clay. Did the finishing process change it very much? I’d like to see how it turned out. Thanks Jonni! It’s been fun trying these faces out. I used cardboard, by the way, instead of tissue paper – I think the texture of cardboard is quite fun to play around with. I haven’t finished it as yet, will keep you posted. Here’s another one I tried, which I finished with acrylic paint. Ooh – I like it. These are really cool masks. Thanks for sharing them. Oops. Well, that didn’t work. I tried dragging an image here, but it just opened it in the window, usurping this page. >:P I’m not seeing another way to add an image, either. Maybe ’cause I’m on a Mac?? Oops – this one looks bigger than it is. The original is 180 px wide. This is a test comment to see if our new system works. The system has the ability to drag and drop images from your desktop to the text box. Well – it worked once. Then it didn’t. Sigh… I’ll keep looking for a solution, though – I really enjoy seeing all your projects. No, we’ll leave it for now. (Nice painting, by the way!) This is a good test of the system. We might shrink it later, if I can figure out how to do that. All fixed. I think…. Thanks for your help, Xan. Now I should think up something to write about so I can put up a new post. 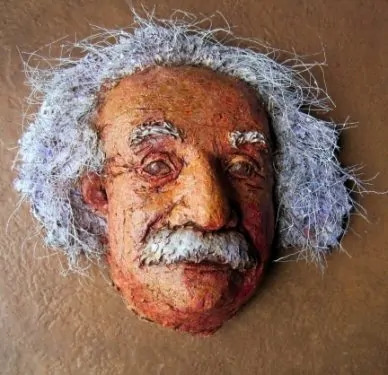 Do people make Thanksgiving decorations out of paper mache? Oh, that’s much more reasonable! 😛 Not click-able to enlarge, at least on my Mac/Chrome, but clear, and more reasonable use of the page! I can imagine paper mache turkeys, maybe posed on piles of hay bales, surrounded by pots of mums and corn sheaves … Or on a table with the gourds and such. Paper mache mushrooms? Seems like it’s all about food, doesn’t it? Or maybe that’s just me! PM Native Americans and pilgrims? Little scenes, like Christmas creches, but Thanksgiving history themed? That would be ambitious! I have just found your site and am blown away by your work. I love the paper mache clay – it really opens up so many possibilities. I direct full scale plays with the 5th graders in my school. This year we are planning to do The Little Mermaid, Jr. I think the paper mache clay will work great to make some head pieces and masks of the sea creatures and for the set pieces inclucing undersea rocks/coral/grotto etc. My question is will I be able to make much larger batches of the paper mache clay – I will need quite a bit to cover the set pieces. Have you had any experience with large batches? Thanks! Hi Michelle. I can’t see why the paper mache clay can’t be made in large batches, as long as your mixing device is heavy-duty. You could double the recipe and use an electric mixer with a paint mixer attachment, and see how it goes. For the masks, you might want to consider using the shop towels with the fast-setting paste, just because they’d be lighter and more comfortable to wear. If you haven’t seen the videos yet, you can see them here. The recipe for the paste is in the second video of the series. Thanks for the quick reply. I like the idea of the shop towels/fast setting paste for the masks – I need to check out those videos. I will also experiment with the large batches. I will continue to monitor your blog to pick up tips. Thanks again for the advice! I truly appreciate how open you are with your techniques, your experimentation with materials, and the collaborative nature of your blog. Thank you! Hi Jonni, here is my flickr link to a vessel that I posted. I have transferred photos my flickr to other sites. I hope this works. Thanks, Christine. For some reason, the comment wouldn’t show your link until I edited it – I didn’t change it at all, but now it works. Weird. Nice vessel, though. I think we’ll need to start using my Facebook page to share photos. I’ll put up a post about it in the next few days, after I get it all figured out. Or at least some of it figured out. I’m a real Facebook dummy, but it can’t be that hard, can it? The mask is now finished. This is how it looks, after painting. The wire “hair” was stuck into the wet paper mache clay during the modeling process, and I used a spray primer so I could get the paint to stick. Jonni, why not use your facebook page. Their photo upload feature seems to work real well. And I think you could also make seperate groups etc connected to your site and facebook account. Love the mask by the way! concerning your posting photo problem. 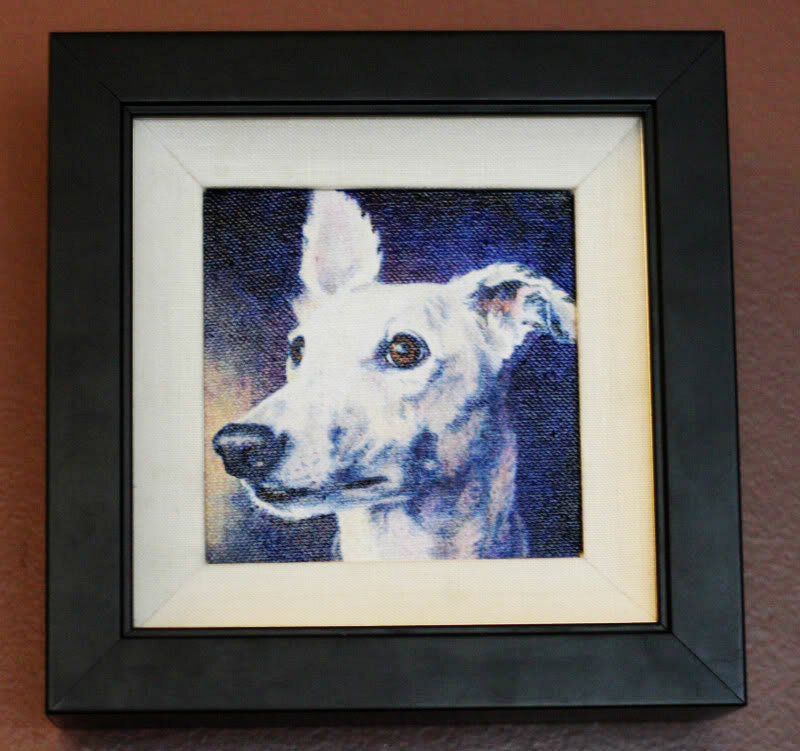 a couple of the mixed media people that i follow use Flicker. Julie Fie-Fan Balzer is one i can think of right now. hope this helps in some way. i enjoy your contributions. Thanks, Susan. Do you happen to have a link for one of the sites you visit that use Flicker, so I could see how they set it up?